clip into PowerPoint, and it will play within the presentation. If it is not compatible you may be able use the movie but will need to launch it in a separate player. As a rule, movies with the file extensions "AVI" and "WMV" will play within PowerPoint, whilst those with the QuickTime "MOV" extension will not. It's possible however that you might be using a version of AVI or WMV which the machine on which you are to present will not play, so as always check your presentation on that machine. Is my movie compatible? - PowerPoint uses "Media player" to run movies. It's confusing because this is not the "Windows Media Player" many are familiar with. If a clip does not run in Media Player, it will not run within PowerPoint. There's a convenient way of checking, - On your PC, click on: "Start" (bottom left of your screen) Then on "Run". 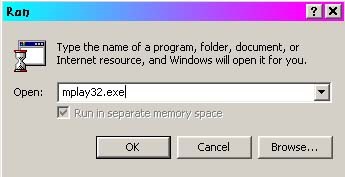 In the box that appears, type: mplay32.exe, and click OK. When Media Player appears, you can check your files, by clicking "File" then "open" If the movie plays, it should play within PowerPoint, if not you may be able to link to it instead. My movie does play in Media Player, what do I do next?